That outcome has been widely confirmed by end users in multiple projects in Refineries and Petrochemical Plants over 20 years. Steam trap monitoring additionally increases energy efficiency above 8% and prevent back pressure and water hammering problems in condensate return headers. Note: Chemical refining processes consume huge amounts of steam. Therefore, a steam saving greater than 15% produces a strong improvement of the EII. 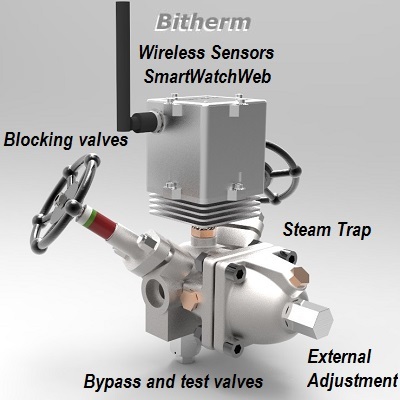 Modern Intelligent Steam Traps combine the excellent performance of bithermostatic steam traps with the innovative SmartWatchWeb™ Monitoring Technology, which through its 4 sensors (Ultrasound, Temperature, Pressure, and Auxiliary) monitors the operation of the trap, detecting any anomaly in real time. In this way, SmartWatchWeb™ Steam Trap Mnitoring System is the ideal tool to implement Intensive Maintenance Methodology. Both concepts are key to achieve huge steam savings and other mentioned benefits. The combination of cable and radio architectures on SmartWatchWeb™ monitoring system sorts out situations where a single topology does not adapt to environment, or does not satisfy project conditions and significantly reduces installation and maintenance costs. Make a quick estimate. Evaluating saving potential on steam facilities or "BASELINE" on energy efficiency projects in steam facility is a task for specialists, but it is feasible to carry out an approximate evaluation online based on basic data, which are known by the user. If you want to evaluate your steam savings potential click on the evaluate button. Throughout more than 20 years we have developed more than 60 energy efficiency projects in steam networks in Refineries and Petrochemical Complexes, ... The success in all these projects has been extraordinary, surpassing even the most optimistic expectations and initial evaluation. The steam savings achieved have generally exceeded 15% (in exceptional cases it has reached 30%) with respect to steam consumption prior to the execution of the project. Highlight that these projects are part of the policy of sustainable growth and environmental responsibility of our Clients, to whom we are deeply grateful for their trust. 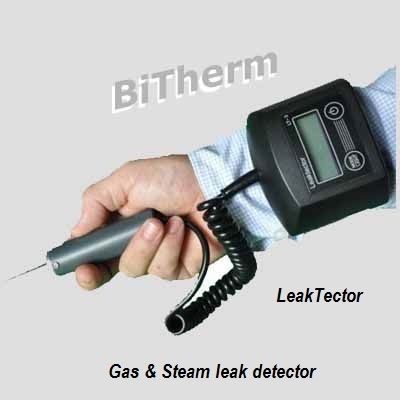 The first generation of intelligent steam traps was developed and patented by BITHERM in 1996. They are formed by a bithermostatic balanced pressure steam trap with mechanical external adjustment device, which allows to eliminate steam leaks and/or repair other incidents without stopping its normal operation. The trap has externally coupled an electronic device based on microprocessor with four sensors (ultrasound, temperature, pressure and conductivity) to monitor its operation. Currently, the third generation of intelligent steam traps incorporate SmartWatchWeb Technology and are the result of decades of experience in the field of inspection and maintenance of steam traps in Refineries and Petrochemical Industries. If you want more information, click on the following button. A distinguishing feature of our range of portable ultrasound detectors is their small size and weight, which allows them to be worn as a bracelet, freeing the operator to carry other elements. It is manufactured in normal version or with ATEX certification for use in potentially explosive atmospheres. We are proud to be leaders in the design of bitermostatic traps (year 1988), intelligent steam traps (year 1996) as well as the development of the Intensive Maintenance Methodology on steam traps. All this experience provides ideal solutions to solve all operational problems in steam traps and enable their repair online, without interrupting their operation or using spare parts, which greatly reduces maintenance costs. We carry out steam saving turnkey projects applying all the resources and knowledge acquired. Our services provide the entire value chain in this area (design, manufacturing, engineering, construction, maintenance, training, technical assistance, ...), being the company with maximum experience in this field. Click next button to obtain technical assistance on steam traps, energy efficiency projects, BASELINE evaluation, steam saving potential, operational problems in steam installations, ... .